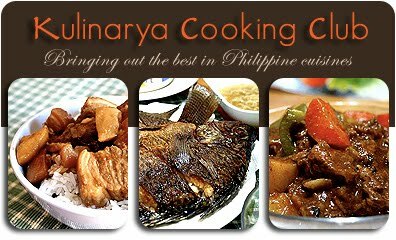 I have just joined the Kulinarya Cooking Club (see information below), a group of food bloggers from around the globe who share a recipe from the Philippines each month. The theme for April is Polvoron. "Wasn't that the crumbly thing that Yaya used to make when we were kids?" The first bite took us all on a trip down memory lane, of childhoods spent visiting the grandparents, of endless fun with so many cousins, aunts and uncles. Polvoron is described as a "candy made of flour, sugar, butter and powdered milk. The flour is toasted, all the ingredients are mixed and shaped into round or oval-shaped molds. It is believed that making Polvoron started during the American occupation (of the Philippines) to use up the huge amount of powdered milk brought in by the Americans". The name comes from the Spanish word polvo, which means dust or powder, and aptly describes the fragile, crumbly consistency of the candy. I had a bit of a challenge making an authentic Polvoron, mainly because I couldn't find the special mold to hold the shape of the mixed ingredients. I decided then to do a cookie version, using the closest mold I could find - a melon baller! 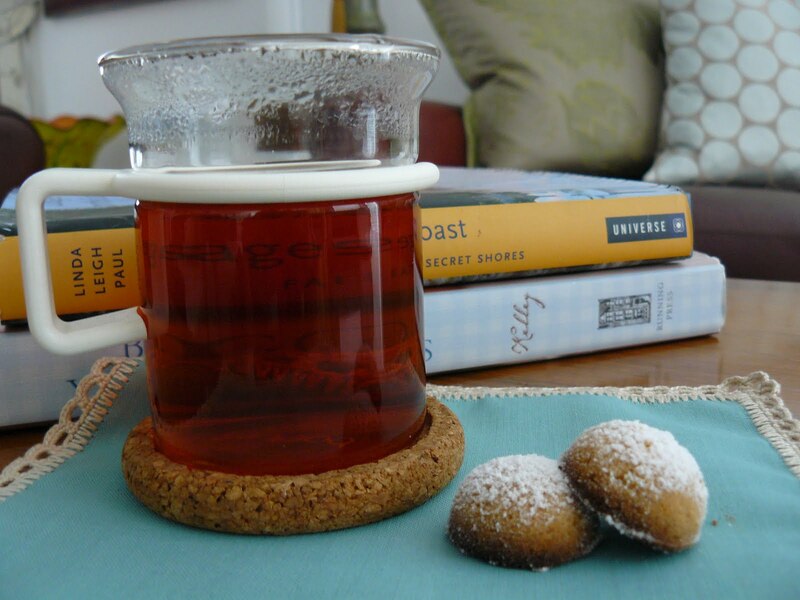 These little bites are a sweet treat with afternoon tea. 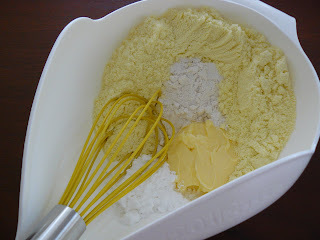 Mix all of the ingredients in a bowl, except for the icing sugar. Use a melon baller or mold of your choice to shape into half-spheres, making sure to press the filling firmly into the mold. Lay directly onto a lined baking pan. Bake in a 200 deg C oven for 10 minutes, or until lightly browned. For a softer cookie, decrease your baking time to 5-7 minutes. 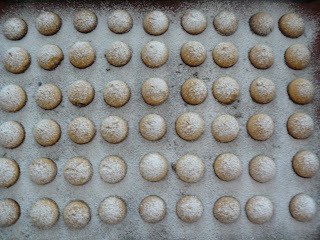 Dust icing sugar onto cookies while still warm. Makes about 55 mini cookies. If you're interested in joining our Kulinarya Cooking Club, please visit http://au.groups. yahoo.com/ group/kulinarya - we would love to hear from you. Here are the members of the Kulinarya Cooking Club (and more to come!). Please feel free to visit and comment on their blogs. Welcome to the Kulinarya Cooking Club. You did a great variation of the polvoron. Well done! Thanks Cherrie Pie and cusinera. I couldn't find the polvoron mold at the Filipino stores in Singapore, so thanks to my melon baller, I was able to improvise! Oh how cute. The melon baller did a fantastic job on the polvoron. I love the addition of cinnamon. Welcome to KCC. Love the twist on the addition of vanilla and cinnamon. And the shape is fantastic. Very classy polvoron. I used a melon baller too on my second try. Much easier than the cookie cutter. Thank you A cupcake or two, divina, peachkins and ninette! I love the flavors of vanilla and cinnamon in a cookie, so my polvoron recipe became a fusion of sorts. 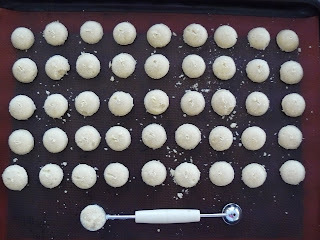 great idea to use melon baller and to bake polvoron..it turned out really nice..I love the addition of cinnamon.. I do hope Filipino stores abroad would start carrying polvoron mold/press..
Hi Annie, I posted a picture of my polvoron from your recipe. At first, I wasn't sure about the cinnamon. But when I tasted the polvoron, it was so good. You could barely taste the cinnamon. I have a melon baller but it's not big enough. I did find a scoop that must have come from a can of coffee or something. It was perfect. I pressed hard and it came out compact. The only difficulty I had was getting it out of the mold. When I'd tap it on the baking sheet, some would break up. But I discovered a trick. I wiped it clean every time I'd fill it up. Then, it was so much easier falling off. Thank you for the wonderful recipe. The melon baller is a perfect substitute for a polvoron mold/stamp. Your pictures are reference pictures are beautiful. Thank you for the recipe. I will give it a go. I'm just trying to figure out what is "pinipig." I left the island for the States when I was 6. I'm catching up. Cool!!! Pardon the bad grammar on last post. I'm having a sugar high from too much ube polvoron.